Update: What do we do now in Syria? The world watches as Assad and Putin destroy Aleppo. Only a few years ago, western leaders hoped resistance organized from Aleppo might overthrow the ruler who tortures children. The city’s sturdy resistance validated their hope. It held out for so long. Now no one wants to rescue it. 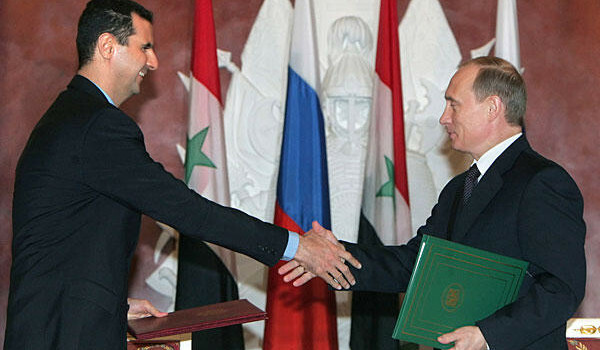 Bashar al-Assad greets Vladimir Putin. President Obama and Secretary Kerry have to stop and ask themselves what they are doing. They must recognize their involvement in the Syrian war so far has not had beneficial effects. Obama has already admitted that lack of proper planning and follow-up in his policy toward Syria’s civil war is one of his biggest regrets as he has for his presidency. Yet he still sends Secretary Kerry out to negotiate another terrible deal, a deal that gives Russia the freedom it needs for its military operations. By now everyone who follows this war tells him to stop this behavior, yet he just keeps at it. Does he think that maybe next time his good offices will work? The battle for Aleppo starts to remind me of the battle for Stalingrad in World War II. The total number of troops on the ground is smaller, but the strategic significance and length of the battle are on the same scale. Putin and Assad are determined to destroy the city, and take it back. They have good reasons for doing so, given their war aims. Kerry’s behavior communicates three things to Putin: we are irresolute, we don’t have coherent aims in this war, and we don’t intend to frustrate Putin’s aims. If that’s our policy, to stand back and watch, we should just say it. We humiliate ourselves when we say, “We’d like to help,” when we obviously don’t care to commit moral or material resources to the effort. You have to say this much: Obama has had two loyal secretaries of state – Kerry and Clinton – who have been willing to protect the president from the bad consequences of his policy. They have done his bidding, and taken the blame. When historians analyze this significant transition in Middle Eastern politics, however, they will not be forgiving of the president. He bears responsibility for this shambles, far more than he bears responsibility for what has happened in Iraq. His predecessor ruined Iraq, but Obama did not respond intelligently to prevent the political and sectarian upheaval spawned by the Iraq war from enveloping Syria. With that criticism, however, do not think as well that Obama’s withdrawal of troops from Iraq in 2011 had a material impact on the military situation in Syria. Borders in the deserts and mountains are long: we would not redeploy our forces to close them, and would have failed if we tried. The war-maker’s argument that we could have prevented this mess if we had maintained troops in Iraq until some unimaginably distant date is vacuous. You could say Assad felt free to start a civil war in his country because we no longer maintained forces several hundred miles away, across the desert, but that reasoning rests on the idea that wherever the United States has troops, there will be peace. What works with NATO in Europe, however, obviously does not work in the Middle East. Garrisons of men and materiel from the west cause resentments and resistance greater than you can imagine. Strategically, our withdrawal from Iraq gave Iran more freedom to operate throughout the region, but they already had a fair presence in Iraq and elsewhere before we left. The Kurds too had more freedom to operate in northern Iraq. In the long run, that was good for us. The larger point is that our decision to leave Iraq after we were no longer welcome may have emboldened the Islamic State, but it did not destroy an area we had just saved. Our 2003 invasion destroyed a lot and saved nothing. If we were to have a beneficial impact on the Syrian conflict, we needed to think intelligently about diplomacy and military operations throughout the region. Yet at no point, before or after 2011, did our foreign policy representatives in Washington show any ability or interest in managing a highly complicated political and military situation to anyone’s benefit. It was all propaganda, diplomacy for show, pronouncements, and ineffectual pleas from people who felt they ought to do something about the tyrants, warlords and jihadists fighting over there. We needed our best talent on this job, but all we had were hacks and time servers with no leadership. The president showed himself the most detached, irresponsible and ineffectual amateur of all. War weariness in 2011, after eight years in Iraq, made our policymakers quite cautious about getting involved in the Syrian war. That was a key criticism of the Iraq war from the beginning: you will stir up endless trouble, cause nothing but bad outcomes, expend all the capital you have available for moral leadership, and end up with nothing but failure and unredeemed blood. Who wants to end up losing the whole game, when you can see that outcome from the beginning? In that sense, I suppose you could relieve Obama of responsibility, as circumstances dictated a bad result from the moment we began bombing Baghdad in 2003. Obama applied his credo, “Don’t do stupid stuff,” pretty consistently, but he defined stupid stuff solely in light of his predecessor’s mistakes. If you want to act effectually, you have to plan for good outcomes. The president didn’t care enough to do that, so Putin moved in. Now we apparently have no moves left to make. When checkmate is inevitable, you resign the contest. We still need a leader who asks, intelligently, “What do we do now?” We need a leader who cares about the answer. This article, first published in October 2016, is still relevant. We have a new president in the meantime, and new conversations about the role the United States ought to have in Syria. See the third article under Related articles for one published not long after U. S. sent launched 59 Tomahawk missiles to destroy a Syrian airfield. In publication since the early 2000s, The Jeffersonian has produced several excellent collections of essays on politics. To learn about these books, and their author, visit Dr. G’s Writing Workshop.